A Regenerative, Agroforestry, Syntropic farm in the Mediterranean, Greece. Dimitri’s passion for changing the world led him to regenerative agriculture. He transitioned his mindset from an economist to an ecologist and committed the last few years to taking his education in his own hands, training with Elaine Ingham, Mark Shepard, Richard Perkins and Ernst Götsch, all leaders of the permaculture/agro-forestry movement. Dimitri's vision and leadership drives the farm. He has a varied schedule from mapping and designing, problem-solving and sharing technical advice. On his days off, you will usually find him in the local forest exploring the flora and fauna with his two girls, Luna and Meli, the greek shepards dogs of the farm. Passionate and hard-working, Georges brings his business experience to the Farm. His long career developing start-ups into successful and healthy businesses has been invaluable to Mazi Farm, applying key principles (from non-agricultural projects) to achieve our future goal of profitability. Georges works on all the infrastructure projects from machinery usage to land reclaiming. Don’t try and race him to the farm - he is the first to arrive, last to leave and you’ll rarely catch him taking a day off. He loves his integration into farm life, so much so, he plans to set up a tent to permanently live on the land! Etienne and Dimitri met at university quite a few years ago now. Unsurprisingly, they ended up sharing a passion for nature and a determination not to end up in a little box. 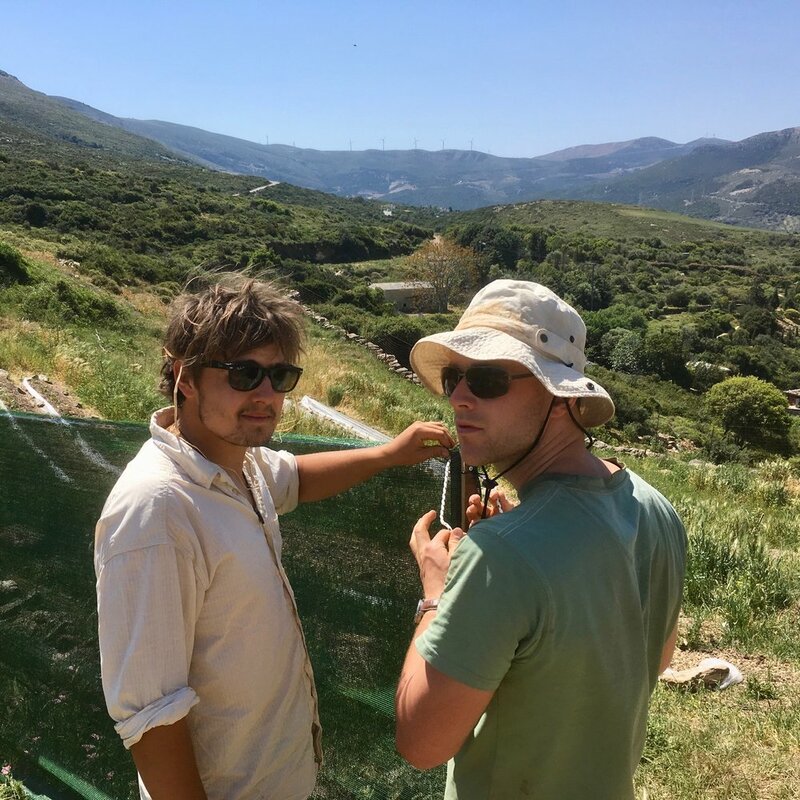 Etienne first approached regenerative agriculture from a policy angle while working for Fermes d’Avenir, a French organisation which aims to accelerate the transition towards an agriculture respectful of man and nature alike. However, one can only bear the Parisian pollution (and the Parisians) for so long and he finally decided to trade his computer for a rake and get some first hand experience of regenerative agriculture. 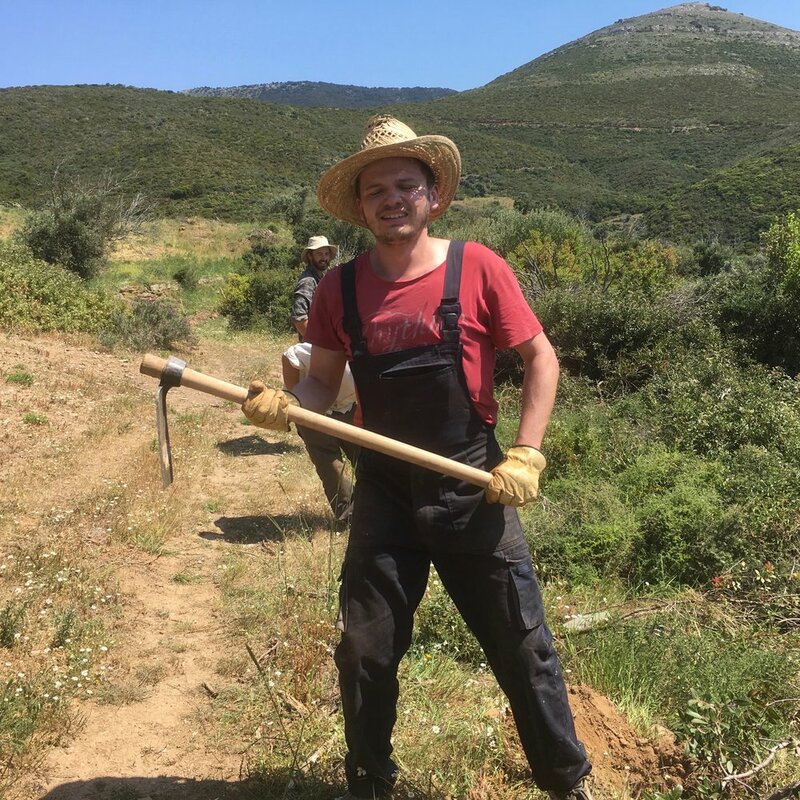 This year he’ll be in charge of our experimental vegetable market garden where he will test out the best techniques to integrate a vegetable operation into an agroforestry system in the Mediterranean climate. Maria is passionate about sustainable living, self-sufficiency and getting her hands dirty. Through this journey, she dived into the underground world and discovered the potential of mushrooms in saving the world. Beyond her role of 'mother of mushrooms', she helps the team translate all things greek, from agronomy to bakery conversations! Maria is the only member that is encouraged to forget her walkie talkie on the land, as you can locate her in an instant with her blasting laugh! Or 'Mazi Mum'. You won’t necessarily see Christine getting her hands dirty with soil but she’s nonetheless a crucial member of the team - the glue that holds the farm together. Christine caters to the team’s daily needs, cooks delicious food with local organic food and oversees our small chicken operation, and most importantly bringer of the good vibes with her contagious smile! Put simply - she nourishes us as we try to nourish our soil. But soon to also get involved with exciting farm projects. Stay tuned! Creative and out-going, Solene enjoys the social life on the farm. She spends her days capturing snap shots of her favourite moments: the contagious farm energy, the endless drive of the team getting their hands dirty and sharing these experiences through social media. In the future, Solene plans to learn more about community building, regenerative farming and develop Mazi Spoon, a commercial brand which aims to support regenerative farms like Mazi, by marketing and selling their ‘beyond organic' produce of superior nutrient quality and environmental sustainability.